Cowes Harbour is the main commercial port for the Isle of Wight and one of the foremost destinations for yachtsmen in the world. It can be entered by day or night and at all states of the tide by vessels with draft up to about 3 metres. Frequent movements of large commercial ships including liners, tankers and container ships using the deep draft channel immediately to the north of the harbour. 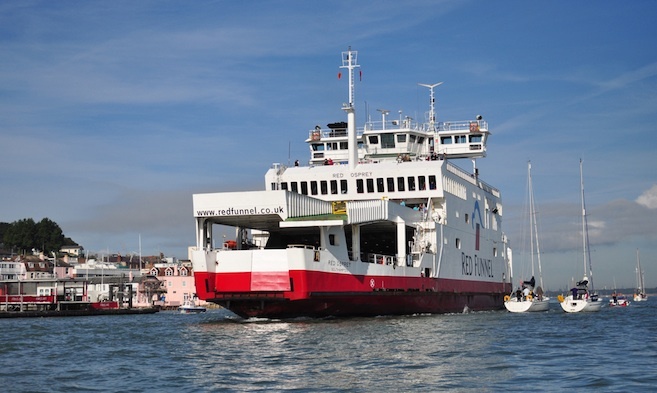 Vehicle and fast passenger ferries and smaller commercial ships entering and leaving Cowes itself. Strong tidal streams running across the entrance at speeds up to 3 knots and up to 4 knots in the deeper water of the Solent. The very shallow Shrape Watersports Area immediately to the east of the entrance. A large number of race marks and moorings in both the Inner and Outer Harbour, mostly unlit and with buoys that can be dragged beneath the surface during rates of maximum tidal flow. Cowes can be approached safely from the north, east, and west. When approaching from the north, care should be taken not to infringe large vessels in the Southampton Precautionary Area (see Southampton VTS Notices to Mariners). Vessels over 150 metres in length have a Moving Prohibited Zone that requires smaller craft to keep a minimum of 1,000 metres ahead and 100 metres either side. 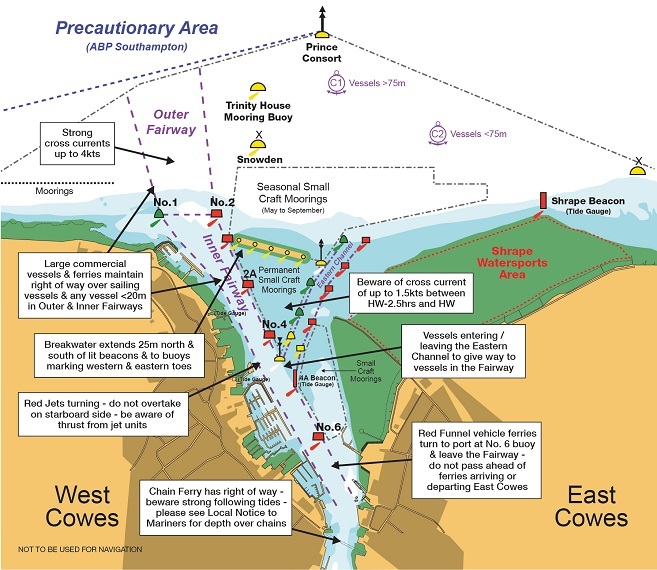 The Precautionary Area can be avoided completely, when taking passage from Southampton Water and the River Hamble, when height of tide permits, by passing to the east of the Bramble Bank and entering Cowes via the Eastern Channel. Diagram of the approaches to Cowes, fairways, and cautions. Approaching Cowes from Spithead and the east, look for the Shrape Beacon, about 300 metres northwest of Old Castle Point. The tide gauge on the Shrape Beacon will indicate if the dredged Eastern Channel is safe to use (Tide height + 2.25m); if not, head for Egypt Point to the west, leaving any small craft moorings and the breakwater to port before entering the Inner Fairway north of the Royal Yacht Squadron. Vessels approaching from the west need to keep a close lookout for unlit mooring buoys inside the large Gurnard north cardinal buoy, and where possible, yachts starting and finishing races off the harbour entrance.